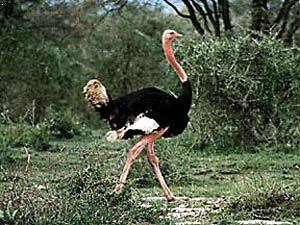 The Ostrich - Although this bird cannot fly, it can run faster than the swiftest horse. he ostrich is sometimes called the "camel-bird," because it is so very large, because it can go a long time without water, and because it lives in desert and sandy places, as the camel does. It is often taller than the tallest man you ever saw, and it neck alone is more than a yard in length. Each of the wings is a yard long when the feathers are spread out; but although the wings are so large, the bird cannot fly at all. One reason of this is, because it is so very heavy, and another is that its wings are not of the right sort for flying. They are made of what we call ostrich-plumes, and if you have ever noticed these beautiful feathers, you will remember that they are very different from others that you have seen. If you take a quill from the wing of a goose, you will find that the parts of the feather lie close together, so that you cannot very easily separate them; but in an ostrich plume they are all loose and open, and would not support the bird at all in flying. The feathers are generally either white or black. There are none under the wings, or on the sides of the body, and only a few small ones on the lower part of the neck. The upper part of the neck, as well as the head, is covered with hair. Its feet are curious, and different from those of most birds. They are somewhat like the foot of the camel, having a soft pad or cushion underneath, and only two toes. The largest toe is about seven inches long, and has a broad claw at the end; the other is about four inches long, and has no claw. Although this bird cannot fly, it can run faster than the swiftest horse. If it would keep on in a straight line no animal could overtake it; but it is sometimes so foolish as to run around in a circle, and then, after a long chase, it may perhaps be caught. A traveller speaking of the ostrich, says, "She sets off at a hard gallop; but she afterwards spreads her wings as if to catch the wind, and goes so rapidly that she seems not to touch the ground." This explains what is meant by the verse, "When she lifteth up herself on high she scorneth the horse and his rider." The ostrich has but little to eat in the desert places where it lives: only some coarse grass, or rough, thorny plants, with a kind of snail which is sometimes found upon them; and perhaps it sometimes eats lizards and serpents. The voice of the ostrich is very mournful, especially when heard at night in a lonely desert. It is said to be like the crying of a hoarse child. It is on this account that the prophet Micah says, "I will make a mourning like the ostrich." In the 39th chapter of Job we read, "Gavest thou wings and feathers unto the ostrich ? which leaveth her eggs in the earth, and warmeth them in the dust, and forgetteth that the foot may crush them, or that the wild beast may break them. She is hardened against her young ones as though they were not hers." See how well this agrees with the accounts given by travellers. They say that the ostrich is frightened by the least noise, and runs away from her nest, leaving the eggs or young ones without any protection; and very often she does not return for a long time, perhaps not until the young birds have died of hunger. The eggs are cream-colored, and large enough to hold about a quart of water. The shell is very hard, and as smooth as ivory. It is often made into a drinking-cup, with a rim of gold or silver.